Maher’s exhibition calendar is getting busy this year. 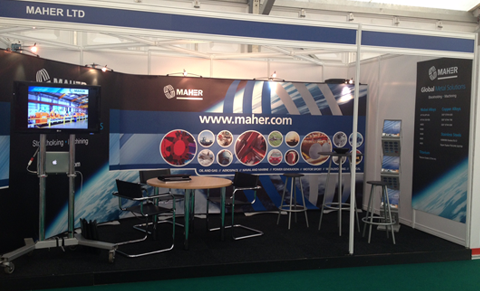 Along with securing our place in Hall 2 for next year’s Offshore Europe in Aberdeen, Maher also has a packed exhibiting schedule for 2014. We have been a tier 2 member of the Advanced Manufacturing Research Centre since 2004 and so when the opportunity came to exhibit at the 5th Global Manufacturing Festival to be held at the AMRC we thought it could not be missed. The festival is held on 24th-25th June and sees speakers from key sectors as well as an exhibition where suppliers can showcase their contributions to the manufacturing supply chain. The Festival is a great way to connect the UK manufacturing supply chain with major international customers. June is a busy month as it also sees our stand travelling to NOF Energy’s Subsea North East event and our Aerospace division will be representing Maher at Farnborough International Air Show. Since opening an office in Singapore last year, Maher has seen a significant growth in business in the region and so exhibiting at OSEA 2014 was a must. Our Sales Manager in Singapore, Lip Wei Ho will be on the stand for the show from 2nd – 5th December and would welcome visits from new customers and old. In the same week but on a different continent, we are also joining the British Valve and Actuator Association on their member stand at Valve World in Duesseldorf. Since joining the BVAA in 2011, Maher has gained a further insight into the workings and requirements of the UK valve industry which has been beneficial to our business worldwide. Valve World is a useful opportunity to showcase the materials and supply capabilities that Maher can offer to this important market sector. If you would like more details on where we will be, please contact your sales person for details.